A monster demonstration on Sunday “729” (July 29) completed a disastrous first month for Hong Kong’s new government and its leader, C.Y. Leung. More than 90,000 people – students, parents, teachers and others – packed the city centre in opposition to the government’s plan for patriotic education classes. This policy is a further attempt by the Chinese dictatorship to tighten its grip on Hong Kong and come to grips with rising anti-government sentiment among young people especially. The plan, which starts on a voluntary basis from September in Hong Kong’s elementary schools, is to be extended to secondary level and become compulsory in 2015. Opposition to what is widely slammed as pro-regime “brainwashing” is massive as this protest march shows. Only days before hand, organisers were predicting a turnout of 10,000! 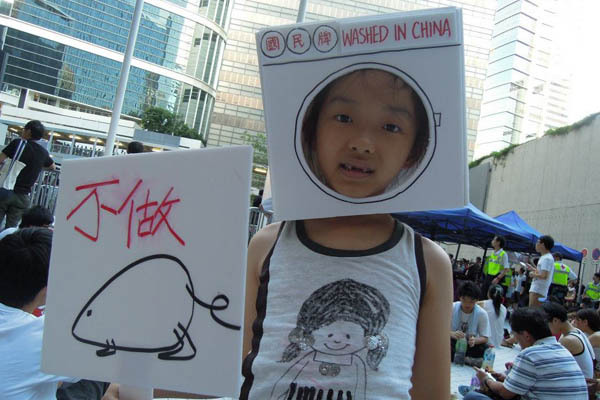 “China wants Hong Kong’s next generation to know how great it is and not know the bad stuff,” a 9-year-old demonstrator told Associated Press. “This national education is like toxic milk powder, poisoning the next generation,” one parent with a toddler told the South China Morning Post. A survey conducted last year by the main teachers’ union, Hong Kong Professional Teacher’s Union (HKPTU), found that 70 percent of teachers oppose the new curriculum. 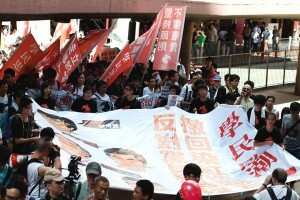 Since then, the mood of opposition has hardened not only among teachers but all layers, as the turnout on Sunday shows. A University of Hong Kong survey conducted last week revealed that only 12 percent of respondents support implementation of the curriculum. Not only was the demo massive, it surely set a new record in terms of the low average age of its participants. The supporters of the CWI, Socialist Action, received an overwhelming response to our demand for a one-day school strike as a necessary follow up to the demonstration. We were the only organisation to raise this idea and campaign for it within the demo. 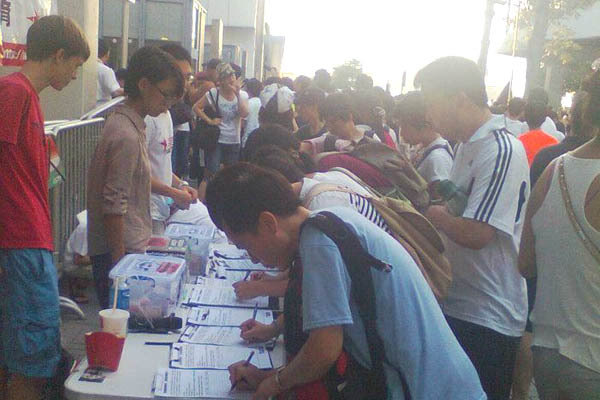 People formed queues at the Socialist Action stall to sign the strike petition and every single copy of Socialist magazine was snapped up (over 200 copies sold). 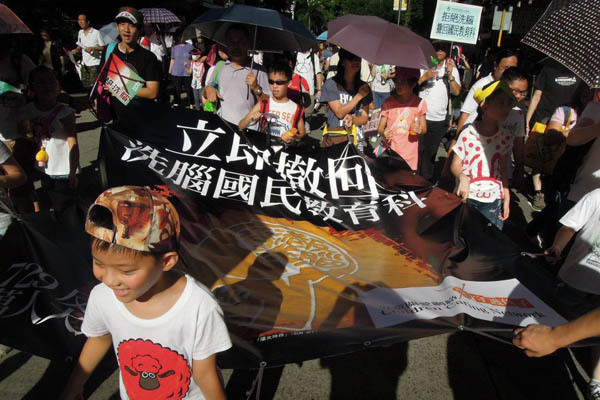 The proposed curriculum aims to promote Beijing’s sanitized version of China’s recent history, denying the repressive nature of the state and erasing all mention of the 1989 massacre of pro-democracy demonstrators, for example. Like other governments, Beijing increasingly uses crude nationalism to justify its rule. A new teaching booklet called ‘The China Model’ has been circulated to schools, extolling the virtues of the ruling ‘communist’ dictatorship. It claims that China’s economic growth and alleged ‘stability’ are the result of its totalitarian system. 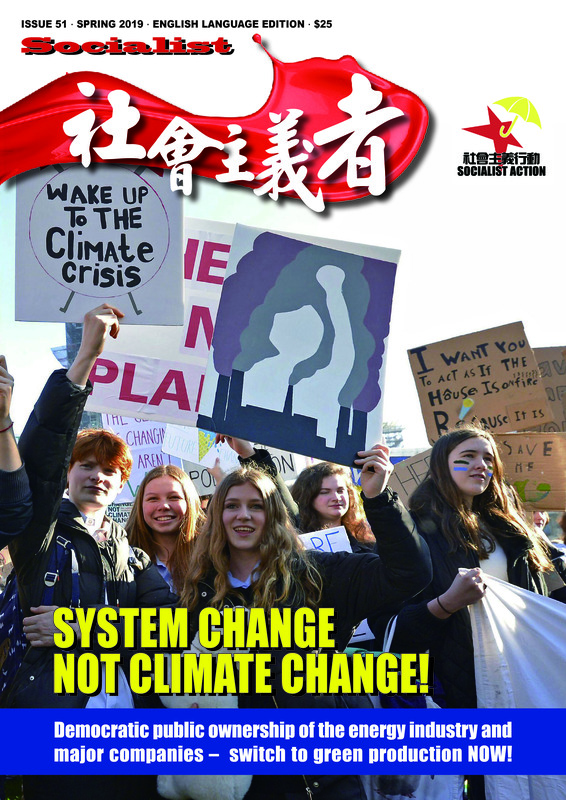 “The level of crudity is even worse than that of the textbooks you find in China,” said one of Sunday’s protest organisers, referring to the new booklet. 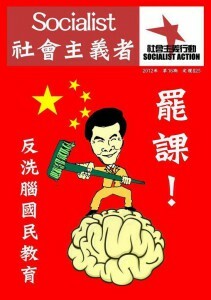 When apologists for the Chinese dictatorship attack so-called ‘multi-party democracy’ as in the US (which ‘The China Model’ booklet dismisses as ‘inefficient’) what they really dislike are the right to demonstrate, to organise, to strike and to form workers’ unions, amongst others – rights that have been won through mass struggle and which provide a crucial platform for workers and the oppressed to struggle against capitalism and exploitation. Reactionary features of the US system such as Wall Street’s control of politics, a Congress in which 47 percent are millionaires, police brutality against protesters, and an undemocratic monopolised media, are opposed by genuine socialists but largely suit the tastes of the Chinese dictatorship. The new national education plan has now become the front line in the wider struggle against C.Y. 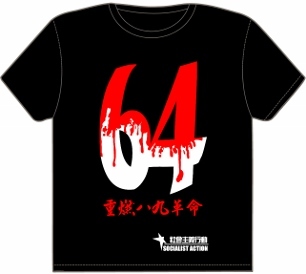 Leung’s unpopular administration – barely one month old! The new chief executive’s first day in office, on July 1, saw the biggest protest march for nine years, with 400,000 hitting the streets to demand his resignation. ‘Elected’ by just 689 mostly super-rich ‘electors’ in March’s rigged ‘small circle election’, Leung’s government is already so crisis-ridden that rumours are circulating of a ‘Plan B’ in Beijing to replace him. Leung already faces numerous political scandals, including the arrest and resignation – after just 12 days in office – of his development minister, now facing corruption charges. 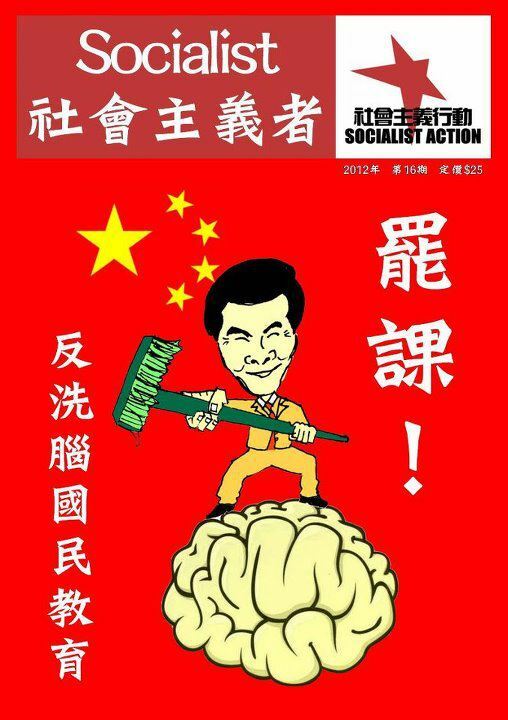 An infected schism within the capitalist elite, caused by the elimination of Leung’s rival in March’s fake election process, has further undermined his administration, restricting his scope for increases in public spending as a means to limit popular opposition. Mass pressure for democratic rights is intertwined with deepening anger over shocking income disparities and a worsening housing crisis. Beyond the struggle over national education, it is clear Leung will attempt to reintroduce repressive security legislation, known as Article 23, which aims to smother Hong Kong’s ‘protest culture’. Article 23 curbs the right to demonstrate and outlaws political groups affiliated to ‘foreign organisations’. Today’s struggle against the school indoctrination plan is therefore a dress rehearsal for the even bigger battle against Article 23. With the government reeling in the face of these multifarious social pressures, some Beijing loyalist political groups are wavering over the national education plan. They fear they will suffer in September’s Legislative Council elections if they are too closely identified with Leung and his policies. Splits in the pro-government camp, underscored by Beijing’s appeal last week to its puppet parties not to “score points” against Leung in the coming elections, offers favourable odds to defeat the nefarious education policy. But to achieve victory against C.Y. and Beijing, it is necessary to escalate this struggle, with preparations for a school strike being the central question. Demonstrations are rarely sufficient in themselves to overturn government policies upon which considerable political prestige is riding. C.Y’s efforts to project a ‘strong man’ image will suffer a fatal blow if he is forced to retreat on this issue so early in his term of office. The entire ruling establishment are clearly shaken by the groundswell of opposition and turnout on July 29, but they also have a history of making short-term tactical retreats and delaying manoeuvres to split, mislead and overcome mass resistance. This was the case with the two most recent changes to the political system – legislation to restrict byelections that was rushed into law earlier this year, and cosmetic changes to the undemocratic electoral system passed in 2010. In similar fashion, in the face of Sunday’s demonstration, the government announced a new committee to “monitor” introduction of the new curriculum. The organisers of yesterday’s protest, including the student group Scholarism, which boasts 5,000 new supporters, and the HKPTU, have rightly refused to participate in this sham exercise. Students, teachers and parent activists are now discussing the next steps. Several tactics have been raised such as strike action and a boycott of national education classes. While not ruling out boycotts as a supplementary form of action, Socialist Action stresses that this tactic alone is far less effective than strike action. A boycott of national education classes would resemble a form of ‘guerrilla warfare’ on a school-by-school, class-by-class basis, with individual students and teachers taking all the responsibility for initiating protest action. This choice of battlefield gives advantages to school authorities using pressure and threats of discipline in order to isolate so-called ‘trouble makers’. Such scare tactics are far less effective against a strike, which by its nature unifies the broadest sections of education professionals, students and parents in common action. A strike must also be an active event with a mass demonstration and rallies to discuss further action if the government refuses to budge, rather than a low-key stay-at-home affair. It is for these reasons supporters of Socialist Action put forward the demand for a one-day school strike, as the first step, to be called no later than September in the first days of the new school semester. Socialist Action was the only organisation to raise this demand on July 29, but it has since been echoed by many others. Feeling incredible pressure from parents and their own members, the HKPTU announced on July 30 that it was considering strike action, if the government does not withdraw its plan. While this is a step in the right direction, it is not enough. Clearly, the government is waiting and hoping that the start of the new semester and its plan to introduce indoctrination classes ‘voluntarily’ into a few schools at first, will lead to a weakening of mass opposition. It is therefore crucial that maximum pressure is exerted by teachers, unionists, parents and student activists upon the HKPTU leaders to set a date for a one-day citywide strike. Students and parent groups should not wait for the HKPTU, but initiate their own discussions, local meetings and activities to build support for a school strike. Socialist Action also stands for the building of mass school students’ union, with students forming active branches in their schools and linking up across the city. Existing student pressure groups are at this stage looser, largely ‘virtual’ networks, on Facebook and the like, but not the mass campaigning organisation with democratic structures that is needed to struggle against wolfish capitalist politicians like C.Y. A one-day school strike against government brainwashing would terrify the capitalist establishment in Hong Kong, signalling a crucial progression from street marches, huge and important as they have been as a means to raise consciousness, towards workplace organisation and collective struggle – the traditional methods of the working class – which for historical reasons are untypical in Hong Kong. Immediate scrapping of national education proposals! For a one-day school strike by teachers, students and related groups against the government plan! 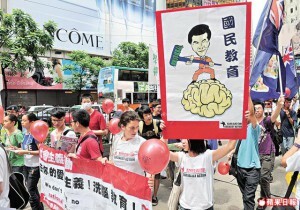 Petition the HKPTU leaders to pressure them into calling strike action! Build democratic student committees in every school to prepare for strike action – for a mass school students’ union to give youth a powerful voice!